Back in October, Kevin and I set out for a tropical honeymoon in Jamaica. We planned on snorkeling, swimming with dolphins, exploring the island, and more. Mother Nature, unfortunately, had different plans. Instead of a week of sun, surf, and sand, we got Sandy. The hurricane, which would later hit the East Coast of the United States, effectively shut down our resort and kept us holed up in our room. Simultaneously, I came down with a wicked stomach virus and spent 24 hours in a ball on our bathroom floor. You can read the whole cheery story on our personal blog, Napp Time. All that to say, Jamaica does not exactly hold positive memories for me. 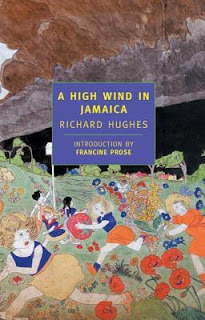 When I saw Richard Hughes' book on the 100 Best Novels list, I groaned inwardly and hoped his literary Jamaica would leave a better impression than my real life experience. The story focuses on a group of children, mainly Emily Bas-Thornton. Emily and her four siblings belong to British parents who have left their homeland to settle in the Jamaican colony. This all transpires in the mid-1800s, when ships sailed across oceans for weeks at a time and horses pulled carts across the Jamaican mountains for days to reach a destination. Early on, the story moves slowly. Emily and siblings travel to visit the Fernandez family and their children. While there, an afternoon at the beach becomes memorable when a small earthquake occurs. Emily thinks with dismay that nothing so exciting will ever happen to her again. Their return home, however, coincides with a ferocious hurricane. The hurricane destroys their plantation home. The children ride out the storm in a cellar, drunk on the rum passed around by adults attempting to remain calm. After the storm, it is decided to send the children back to London, along with their Fernandez playmates. The island is simply too dangerous. Soon after setting out on their journey, their ship is taken by pirates. The children inadvertently fall into their custody when the captain of their original ship leaves them behind, thinking them dead. For me, here is where the real adventure begins. The children and the pirates co-exist uncomfortably, each not truly understanding the other. The children, though, are largely unaware of their ignorance. They are subjected to highly adult situations, including death, murder, piracy, and even a hint of sexual abuse. Yet, as children, they understand these things only from their still underdeveloped knowledge of the world. The key to High Wind lies in this infantile perspective. Their innocence and self-absorption commands their worldview. Hughes does not tell the story directly from their viewpoint, thus allowing the reader some further understanding of the actual events taking place. Even still, the whole story is painted with their emotions and perceptions of people and events. Hughes spends significant time showing their emotional responses to the events surrounding them. This gives a simple adventure story an air of magic and childlike belief, couple with the darkness of losing one's innocence. Before starting on the 100 Best Novels list, I had never heard of Hughes, much less High Wind. This, as it turns out, is exactly the sort of book I was hoping to find. It is a novel rich in character and symbolism, while retaining an engaging plot. In some ways - pirates, anyone? - it reminded me of a darker Peter Pan. I suppose it was the sense of children doing adult things, but not quite understanding the significance of their actions. I enjoyed the adventures of Emily and watching her unique coming of age, despite the reminder of Jamaican hurricanes. Those of you uninterested in the happenings of royalty should skip this post. Actually, you should probably have skipped the Internet this week. In case you missed it (seriously, how could you? ), the royal baby entered the world on Monday. Prince George Alexander Louis of Cambridge now sits third in line for the throne. This is the first time in decades that this many generations have been lined up. That fact is due primarily to the title subject of this book. In a bit of fortuitous timing, I completed Robert Hardman's biography of Queen Elizabeth II on the royal birthday. (Ok, I'll admit, I pushed myself through the last few pages just so I could revel in the connection.) If you have been around the blog since the early days, you know of my adoration for all things royal. I even read an unauthorized biography of Will & Kate's love story back in 2011. For me, it's an indulgence verging on obsession - and I'm ok with that. So I spent a good part of Monday and Tuesday watching a live feed of hospital doors. Who cares? So did a whole bunch of other people. At least I also invested time in understanding why the monarchy remains an important part of British government. Hardman offers an overview of the Queen's life and responsibilities apart from scholarly works which have already been written. He speaks much more colloquially and informally, though he steers far clear of tabloid-style gossip. For me, he struck a great balance. He kept the material interesting and engaging without focusing on the salacious. Considering my lifelong love of British royal history, I found myself surprised by how much I learned from Her Majesty. I think this can be racked up as another case of me being unfamiliar with recent history. Most significantly, Hardman demonstrates the breadth of the Queen's activities, the modern role of the royal family and how it has developed, and the significance of the Commonwealth. Hardman was granted several key interviews which made the book not only more reputable, but also more enjoyable for us royalists. Prince Andrew - Duke of York and the Queen's second son - and Prince William - Duke of Cambridge, Queen's grandson, second in line for the throne, and new father - both offered perspective into the Queen's life and work. From the amount of content from each of them, I guess they only had one meeting each with Hardman. Still, having the personal, familial touch really did add something to the work. 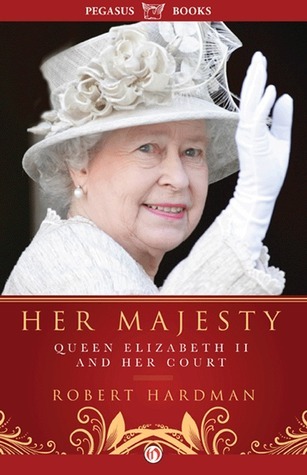 The release of this book fell in conjunction with the Diamond Jubilee, marking 60 years of Queen Elizabeth's reign. Her time on the throne has encompassed some remarkable changes not only in Britain, but the world. There have been a few rough patched, but, overall, the Queen has guided the transitions well and remains beloved by millions. The place of the royal family looks entirely different now than it did at the start of her reign. And, yet, these changes appear to be for the best. With the birth of a new prince and the global love for his parents and ancestors, the House of Windsor seems poised to enter a new era with grace and class. In mid-July, Kevin and I went up to see his family in Michigan. It's about a 5 hour drive for us from nowhere, Ohio. When we go, I always try to find an audiobook that will keep us both suitably entertained; trust me, it's not an easy task. Kevin needs something that will keep his attention while driving; I need something that will keep me intellectually engaged as well as keeping me awake. Since I have been on a bit of a frenzy lately about working toward my 100 Best Novels goal, I set my sights on finding a list member to listen to on the trip. I knew it needed to be something fairly short. We don't do well at finishing books that remain incomplete upon returning to Ohio. We like to talk on our drives, as well as throwing in a few podcasts. This typically leaves 4-6 hours round trip for a good book. Normally, I am no fan of animal stories. In fact, I have never even seen Lassie or Old Yeller. Since I never had a non-swimming pet growing up (my dad hates animals), I simply never developed the bond that so many people have with four-legged creatures. Frankly, I don't get it. Until we have a dog of our own some day, I know I won't understand the relationship evoked between man and his best friend. The closest I have yet come is the mild sadness I felt when my grandparents' farm dog died or the few tears I shed after playing with an adorable puppy at the mall pet store and worrying someone awful would adopt it. Due to this deficiency I have in pet love, I tend to steer clear of pet stories. Knowing I don't connect with them, I prefer books with which I do identify. Give me Atonement over Marley and Me any day. Still, Modern Library and their great list called for at least one animal story (stayed tuned...their may be more lurking in my future). 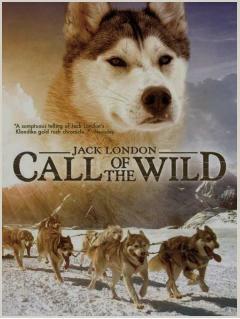 Jack London's Call of the Wild easily qualifies to be called a classic. As a child, I read my Great Illustrated Classics copy of this work several times. As we listened, I could still picture the hand drawn images of Buck on each page. For those of you unfamiliar with the story, London weaves the tale of Buck, a dog kidnapped from his cushy life in California and sent to work as a sled dog in the northern most parts of North America. Buck serves as narrator and protagonist. He works alongside other dogs and works for a variety of human masters. The most interesting thing to me in this tale is that London chooses to tell it from an animal perspective. For the most part, this keeps the language unchanged. There are, however, a few sections which cause a bit of confusion. At one point Buck describes what seems to be a monkey, though a monkey would be pretty out of place in the tundra. This may be the first book that Kevin enjoyed more than I did. I did not disenjoy the book, but, as I mentioned, animal-centric stories just aren't my thing. I found the historical context interesting. I liked some of the characters. I enjoyed seeing Buck's character development, even if he was just a dog. London wrote a fine book. At the end of the day, though, it's just not my genre. Maybe someday, when Kevin buys me a little pup of my own, I will revisit Call of the Wild and understand the emotional relationships between Buck and his masters. Do you like animal stories? Am I crazy for just not getting it? After my realization that completing my 100 Best Novels challenge will take years, I have gotten a lot more serious about focusing my reading on the list. In an effort to speed up the process, I have taken to downloading audio books. I listen while I get ready in the mornings. Nothing like doing your makeup to the words of classic literature. When I saw that my library offered an audio version of The Postman Always Rings Twice read by Stanley Tucci, I simply could not pass that up. Having Tucci's familiar voice as narrator kept me engaged, even early in the morning. Picturing Tucci as main character Frank brought the story to life for me in a wonderful way. One of the fun things about the challenge is that moment when you read a book you've always known existed, but never actually known anything about. That's how I felt with Postman. It's one of those books (and later movies) that echoes throughout popular culture. I had heard the title countless times, but somehow I never had even the slightest idea about the plot. This summer, I have been casually participating in Tyndale Media Center's summer reading program. If you read five books from their list and review them online, you can get one book free. Not a bad deal. The first book I read for the challenge was Still LoLo. I am avoiding reading anything from the fiction section of the list because, well, Christian fiction is not my genre of choice. On the other hand, I do not read nearly enough Christian nonfiction. 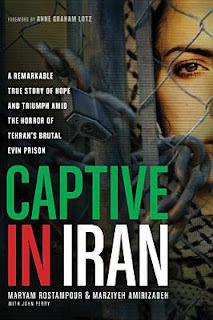 Captive in Iran reminded me of that fact. Last year, I read a memoir from revolution-era Iran. Before then, I knew very little about the country. Maryam Rostampour and Marziyeh Amirizadeh offer perspective on modern life in Iran as a Christian. The country, unsurprisingly, is very dangerously for followers of Christ, particularly those who were born to Muslim families. Rostampour and Amirizadeh spent years sharing the good news of Christianity with nearly everyone with whom they came in contact. Then, without warning, they were arrested and sent to Evin Prison, they main facility in capital city Tehran. The book chronicles their journey through the prison and judicial systems in Iran. From the first pages, I found myself stunned by their attitude and outlook. These women have faith like I cannot even comprehend. Their devotion to sharing Christ in spite of real dangers puts me - and most American Christians - to shame. They continually expressed their honor to be suffering for Christ. What an incredible thought. The woman take turns sharing the story of their near-year of imprisonment. At times, the narrative is a blur of characters. They share the tales of many fellow inmates. This parade of despondent women, can become confusing at times, particularly since their names are culturally unfamiliar to the Western reader. Still, every story they share made it to the book for a reason. Beyond the religious persecution Rostampour and Amirizadeh endured, the Iranian persecution of woman can be seen here for the overwhelming and devastating problem it is. My heart broke to read of women imprisoned with their young children, isolated from their families, and even executed for crimes they either did not commit or would not be considered crimes at all in other nations. One amazing and, yet, somehow unsurprising aspect of the story was the multitude of chances Rostampour and Amirizadeh had to share Christ with those around them. Despite their "betrayal" of the national religion, the women became beacons of light to their peers. Fellow prisoners and even guards came to them asking for prayer. Many came to know Jesus. What a beautiful reminder that God sends His love even to those who have been outcast by society through whatever messengers He deems fit. This book served as a solemn reminder for me of the persecution going on around the world. We are so complacent here and I believe our faith suffers for it. The faith needed to endure such oppression is incredible. We could do well to follow the examples of Rostampour and Amirizadeh. A recent attempt by Kevin and I to create a list of 30 goals we want to achieve before 30 left me realizing what a huge task this 100 Best Novels thing is. To my portion of the list, I added my goal to read this entire list compiled by Modern Library. When I sat down to look at what that would mean over the next four years, I suddenly was met with the immensity of my undertaking. I need to read two of these books per month for the next four years to meet my goal. Talk about a challenge! Never fear, I will do it (although maybe not by age 30). Still, the realization gave me a big shove in the direction of the classics. 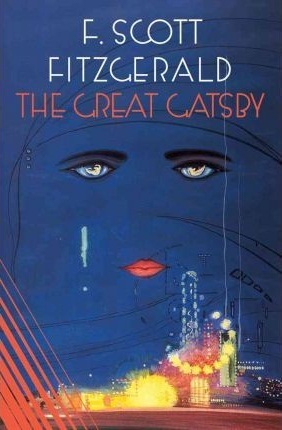 I posted about my experience rereading Fitzgerald's The Great Gatsby on Monday. I was hoping to post about another member of the list today. However, upon preparing this post, I realized I made a mistake. I read H.G. Wells' classic science fiction novel, The Invisible Man. I meant to read Ralph Ellison's Invisible Man. Sigh. No wonder I could not figure out how this story pertained to racism. The really pathetic thing is, this isn't the first time I've read one book thinking it was another. The mistake did not turn out all bad, however. I had not previously read Wells' short novel (Thank goodness it was short! I don't feel so stupid that way!). Wells, who also wrote The War of the Worlds deeply affected the face of science fiction writing. Since I do endeavor into that genre from time to time, I certainly benefited from reading one of the pioneers. 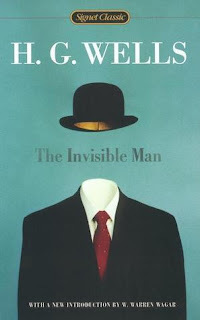 Wells' story centers around its title character, the Invisible Man. Wells does not reveal the characters invisibility right from the start. Instead, he allows readers to engage in the mystery before revealing the truth. The story turned out to be a fairly simple one. Man experiments scientifically, eventually turning himself invisible. He dreams of the power this will give him, but mostly it turns out to be a deterrent from enjoying anything good in life. People don't understand him. He gets angry and vicious. People kill him in a mixture of self-defense and misunderstanding. In the middle, Wells gives a fairly long explanation of the invisibility and how it was made possible scientifically. I suppose some science fiction readers want to see the break down of how things are working, but, for me, I found that passage to be a bit arduous. Wells could have given a more general overview and left out the detailed science stuff. I understand why it's there, I just would prefer a focus on story. In its entirety, the whole thing lasts less than a couple hundred pages. The story moves quickly and is easy to read (minus that long science-y part). I did not find it to be anything spectacular, but I also think I do not have the same appreciation for its ingenuity as its contemporaries. Wells, I'm certain, was not the first science fiction writer, but he make marks in the genre that have lasted over a century. 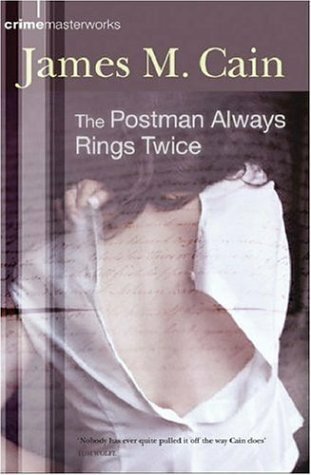 I don't think this work belongs on the 100 Best Novels list like I thought it was, but it still has significance in its own way. Have you ever read one book thinking it was another? Was it a disappointment or a happy surprise? Happy belated Independence Day! I meant for this post to go up on the actual Fourth but, you know, the whole glasses/headaches deal. I hope you had the day off like I did and got the chance to read some great books! In celebration of American tradition, I thought today would be a great day to jump back to the 100 Best Novels challenge with some classic American literature. Many call it the great American novel. Now, personally, I would argue that title belongs to Harper Lee's To Kill A Mockingbird, but we are not talking about that masterpiece today. We are talking Fitzgerald. Because I am still waiting on my glasses to come in, I have been avoiding "screen time" outside of work at all costs. In some ways, it has been refreshing to break from the Internet in my leisure time. In others, it has been intensely frustrating to be isolated from one of my favorite activities: blogging. I have felt a gain in momentum both her and on my personal blog the past few weeks and this eye strain ordeal is killing that. Finally, I could not take it anymore. I decided to write this post by hand. I do so while listening to Pavoratti on vinyl and sitting next to a lit candle. The whole thing felt very retro and also a bit like my middle school journaling days (minus the opera). All I needed was a typewriter. I dropped a hint to Kevin about how cool it would be to have one of those and went to work. Turns out, not even tired eyes or my illegible handwriting can keep me from talking about books! When I read Beth Revis's Across the Universe two years ago, she impressed me with her imaginative, unique creation. 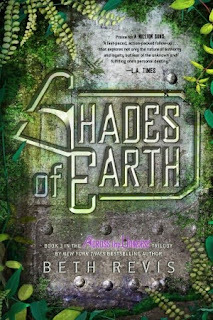 As I read book two several months ago, I saw the same creativity clouded by one-dimensional characters and a gimmicky plot. Still, the book remained intriguing enough to hold my attention. Book three, Shades of Earth, completed the inverted metamorphosis for me. In it, I saw little of the ingenuity which originally captivated my attention.